I sometimes have a hard time recalling people’s names. It’s most likely an age thing, and it can be frustrating. When asked for a restaurant recommendation, however, I can usually spout off names without hesitation. The brain works in mysterious ways. The request I field most often is where to go for a celebratory dinner. 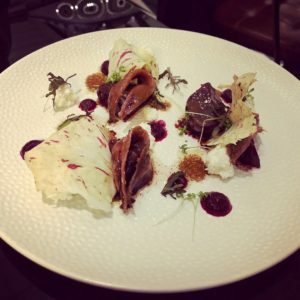 Fiola and Fiola Mare, two restaurants from Chef Fabio Trabocchi and his wife Maria, are constants in my responses. There’s now another name to add to the list. Del Mar. Del Mar, located at the new District Wharf, is the Trabocchis newest addition to their stellar group of restaurants. This one takes its influence from the coast of Spain, Maria’s native country. If you follow her on Instagram, you can view the jaw-dropping photos she posts during visits with her family in Mallorca. Visit the restaurant to experience a similar sensation of awe. Del Mar is elegant and refined, as we’ve all come to expect from this dynamic duo. 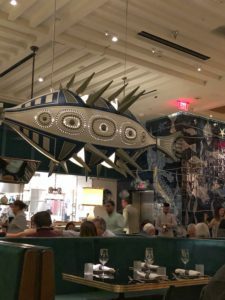 But more notably it’s breezy and fun, with artistic touches dispersed throughout the restaurant, including a dazzling fish sculpture hanging from the ceiling. Servers wear light blue seersucker jackets, which I find quirky, but the uniform manages to further evoke the European seaside theme. It’s not difficult to imagine that you’re at a coastal resort. It doesn’t hurt that you can actually see water, albeit the Potomac River, from the restaurant. Del Mar means “of the sea,” so constructing a meal that is seafood-focused is a no-brainer. Raw fish, grilled fish, cured fish, baked fish. Expect seafood with a Spanish accent, obviously, but there are unexpected twists on ingredient pairings. One of the more robust sections of the menu features raw fish. 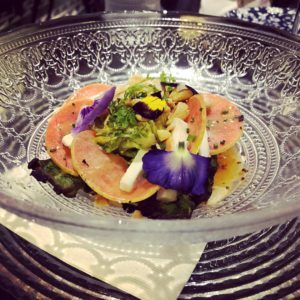 Kanpachi with salted kumquats and ginger leek oil; clams with cucumber, smoked trout roe, and meyer lemon foam; and octopus carpaccio with Basque-style pepper are a few menu standouts. Salads include grilled red beets with anchovies and sheep’s milk cheese, a lively fusion of salty and sweet. There’s also charred romaine hearts with paper thin sliced apple, goat cheese, and almonds. It’s a conventional ingredient pairing that stuns with its vibrant flavor and unconventional beauty. 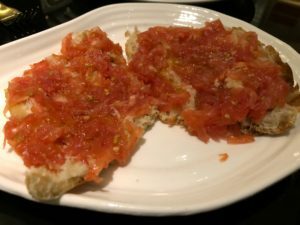 On the cold tapas side of the menu is Pan con Tomate. Tomatoes, garlic, and olive oil are slathered atop slices of bread so crunchy that the sound nearly penetrates the exuberant noise level in the high-ceiling room. It’s straight-forward compared to some of the other dishes, but a worthwhile addition to the table. The selections of paella with varying combinations of seafood, sausage, or duck are enticing. Intended for at least two people, it’s not going to work for me on this visit. 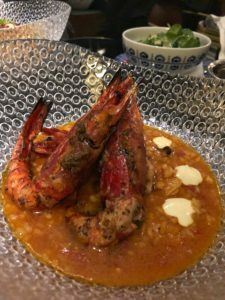 An excellent alternative for one is Arroz Caldoso con Carabineros, a zesty combo of prawns and monkfish swimming in soupy Mallorcan rice. I want to devise a trivia game for my kosher-keeping husband called “name that branzino.” I would show him a photo of one of the countless versions he’s consumed in DC restaurants over the years, and he would have to identify the restaurant. 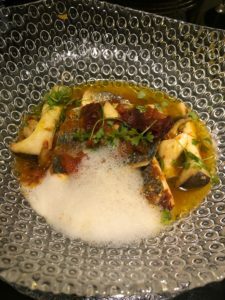 Del Mar offers up a sophisticated preparation with tomato confit, porcini mushrooms, saffron, and a popular Chef Trabocchi accent…. foam. My husband would recognize this one in a heartbeat, in part due to distinctive glass plates. Charcoal-baked potatoes dressed with chives, dried chopped black olives, and a sprinkling of breadcrumbs is one of two sides on the menu. I’m reminded of the mashed potato dish I made for Thanksgiving, but the version here is created by a Michelin-starred chef, so it’s safe to say it’s considerably more complex in flavor and texture. 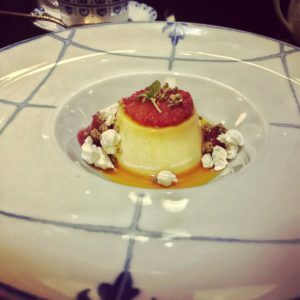 Flan de Maria with vanilla custard and blood orange dots of meringue is an exquisite finale. 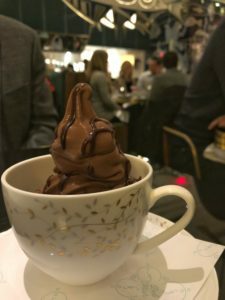 But I’m just as attracted by the dense chocolate soft serve ice cream. Maybe more so. The Trabocchi name is synonymous with quality, finesse, and style. Del Mar lives up to the family name and then some. The dining experience at Del Mar is a memorable one, and that’s something I seriously treasure these days. The gambas al ajillo at del mar are the best I’ve EVER had!! Such a lovely place, and the cocktails were exquisite. Can’t wait to return and try some of your favorites, too, Lori. I’m heading back Friday night- so I’ll give the gambas al ajiilo try! Thanks for recommendation!